Amy and Paolo are getting married! 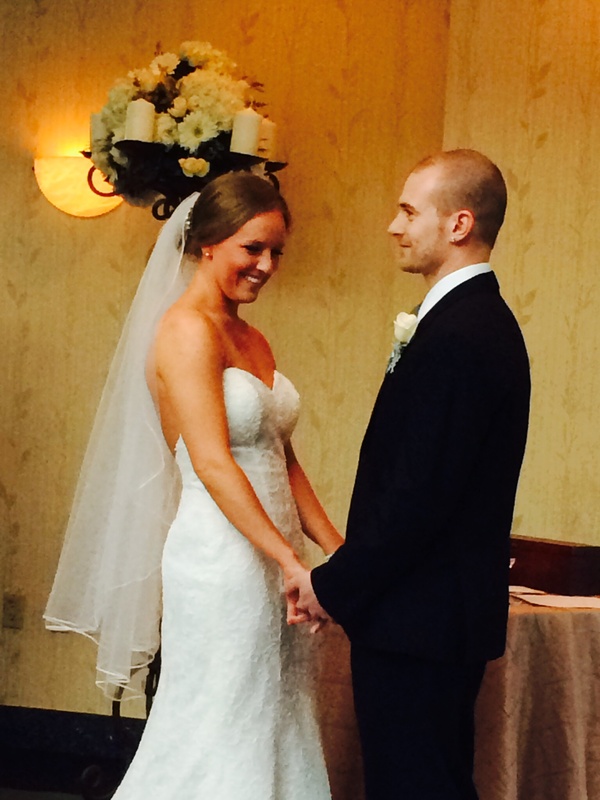 Ok, they got married – April 5, 2014. When we heard the news last winter, Bobie suggested I make them a wedding gift. I decided to offer to make them a side table – seems like we have a dozen and they’re very useful beside a bed, chair, couch, etc. We had them over for dinner before the wedding and told them what we had planned. They were excited and I suggested we needed a planning call to tie down the details. 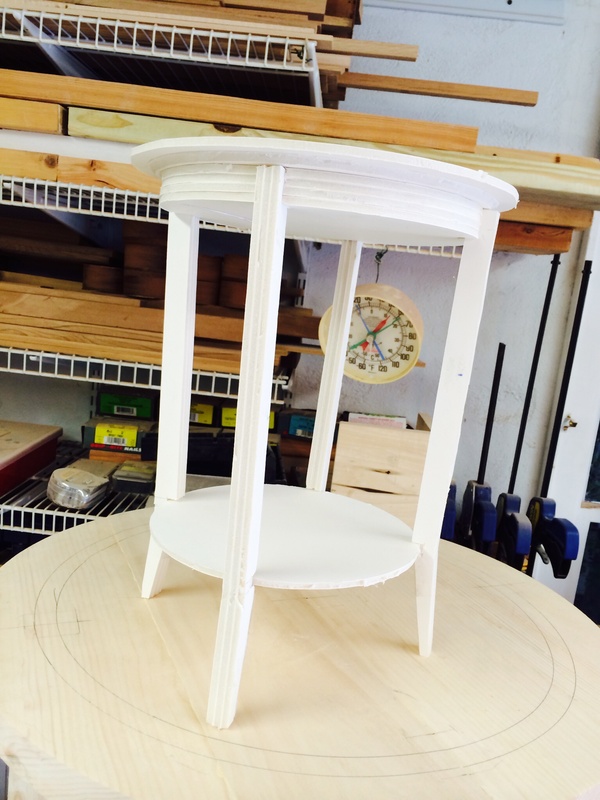 I had a call with Amy and we Googled ‘small side tables’ together – almost immediately she pointed out a round table with a shelf and Hepplewhite style slightly curved legs. 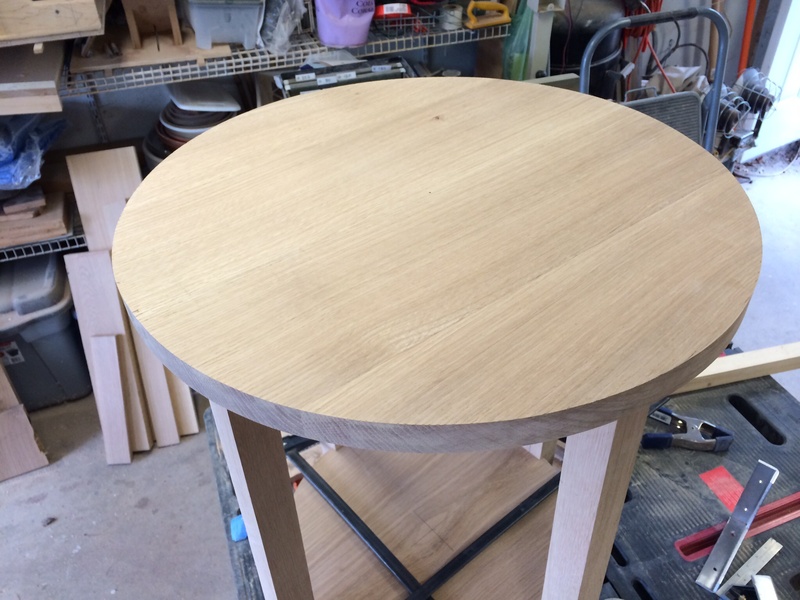 Now I was really excited – the idea of making a round table and especially figuring out how to make the curved rail would add a challenge. 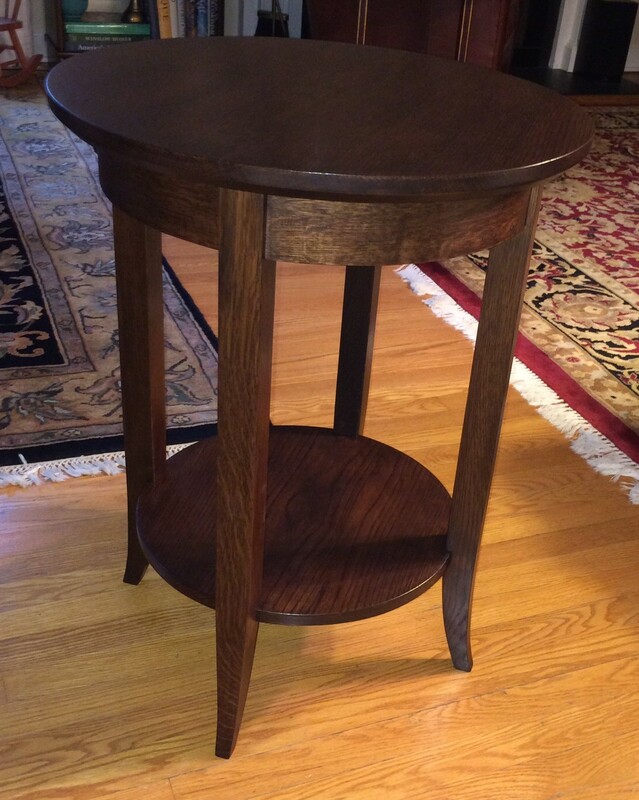 They like some dark, mission style oak furniture in our house, so I decided to use white oak. The first order of business was to make a model and work out the proportions. Paolo gave me a height that would work with there couch of 29 in. I build a half scale model out of foamcore. Next was to make a full size prototype to work out the details, especially how to make the curved rails and how to join them to the legs. I used a mix of poplar and pine. After considering making the rails by steam bending or by bent lamination, I opted for ‘wigglewood’ – bendable plywood. I build a form curved to match the inside of the curve of the rail. I glued two pieces of wigglewood together an clamped them to the form and, once dry, they keep that shape. I thought the legs might be difficult to get the curve at the bottom, but it was simply a matter of cutting a rectangular piece about 1 /12 x 3 inches, marking out the curve I wanted and using the bandsaw to cut it out. The finished legs are 1 1/2 inch square at the top going into a curve and the bottom finishing at about 3/4 inch square. 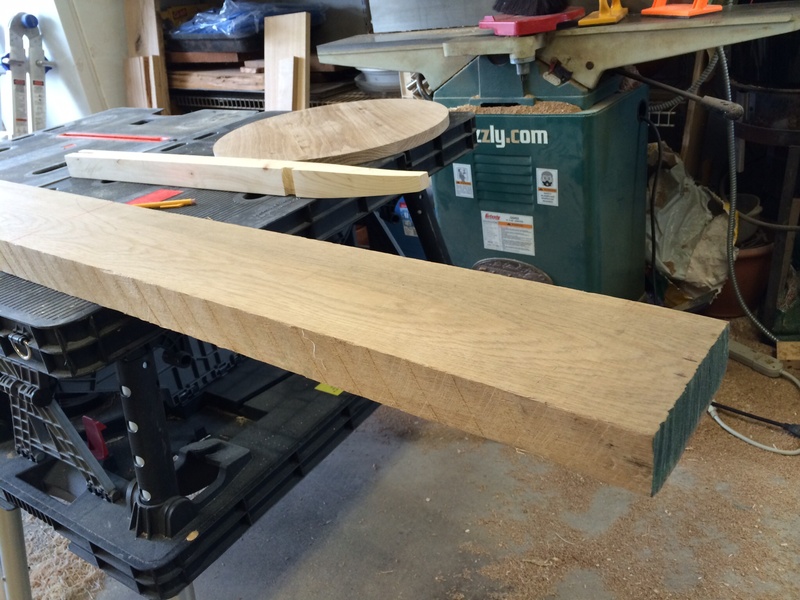 I joined the curved rails to the legs with a mortice and tenon joint. I picked up some great looking white oak at my lumber supplier. I was able to lay out the legs to show some quartersawn grain on the faces. The top was put together from four pieces of riftsawn stock to make a very straightgrained ‘calm’ top. The bottom shelf is from three pieces with a nice oval grain pattern in the center. The curved rails were a cinch, given the prototype, with two changes – the outside curve got a covering of quartersawn white oak veneer and the inevitable secret drawer. I didn’t ‘prototype’ the drawer because I wasn’t concerned with how it would work. I fitted a 1/4 inch piece of plywood into the 4 legs at the same level as the bottom of the curved rails for the drawer to slide on. I built a drawer from 1/2 inch poplar joined with finger joints. 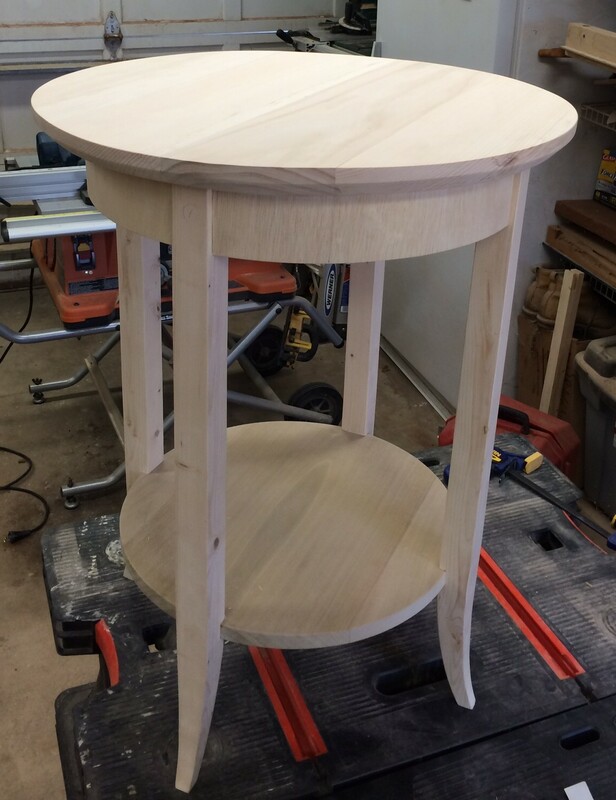 The challenge was finger jointing a curved front to the drawer. I cut the finger joints with a router jig I have, then fitted the curves with a chisel. The drawer bottom is 1/4 inch plywood with white oak veneer. The four legs have a dado cut into them for the bottom shelf to fit into. I glued it in and them put pocket screws in from the bottom for good measure. After easing all of the edges on every surface, I got to finishing. 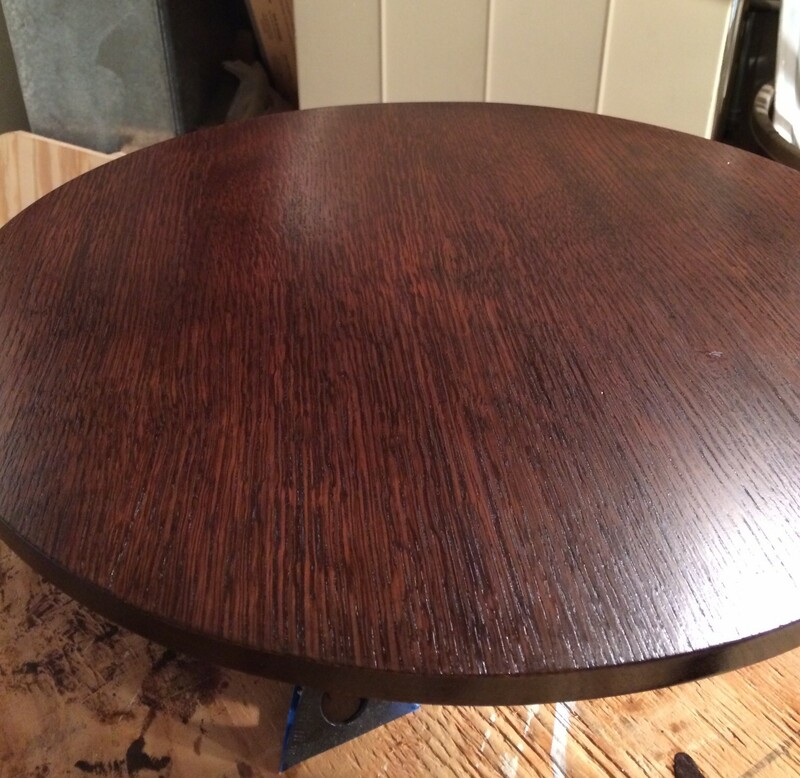 They wanted a dark brown tone, so I started with boiled linseed oil, followed by General Finishes Espresso stain, then the medium brown Transtint dye and finally 6 coats of Arm-R-Seal. The last couple of coats in satin. The inside of the drawer has about 5 coats of spray shellac.